I received an e-mail from a friend in Chicago asking me to make her a hat. Actually, she wanted me to make her a hat, scarf, and a sweater. I believe there might have been a request for gloves, too. She offered to pay, of course. Whew. That's a hell of an order. With all the knitting already on my plate, I decided that I'd just make her a hat for free. I went online searching for a hat pattern that I liked. I found one and knit it, but it turned out waaaaay too small. So small, that it's going to have to go to her granddaughter (who will be the recipient of the baby "ear hat" I wrote about below.). I realized that the hat wasn't going to fit an adult before I was done with it, but decided to keep knitting anyway. I'd just give it to either an adult with a toddler-sized head...or a toddler. I got both stitch and row gauge, so that wasn't the problem. The pattern even shows an actual adult wearing the hat, so I thought it would be fine. I kept searching for a hat pattern then I realized that, um, I'd designed a couple of hats in my day, and that I'd just make her one of them. She's getting the Irish Hiking Hat (the pattern is free in the sidebar.). I didn't make the fold-up brim because I thought she might think this version was more stylish. I used the Paton's Classic Wool that I had left over from my DNA scarf. 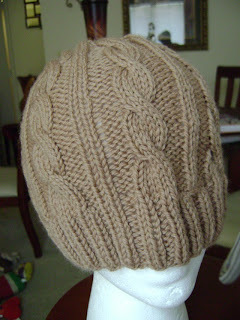 When you said you were looking for a hat pattern, my first thought was "but you design them!" *whew* I'm glad you remembered! That IS a tall order but I know you'll come through just fine. LOL. I initially wanted to do something that I hadn't designed because I wanted to see what else was out there...And after that failed attempt, I started to realize that it would have been easier to just knit one I already designed. Nice hat! 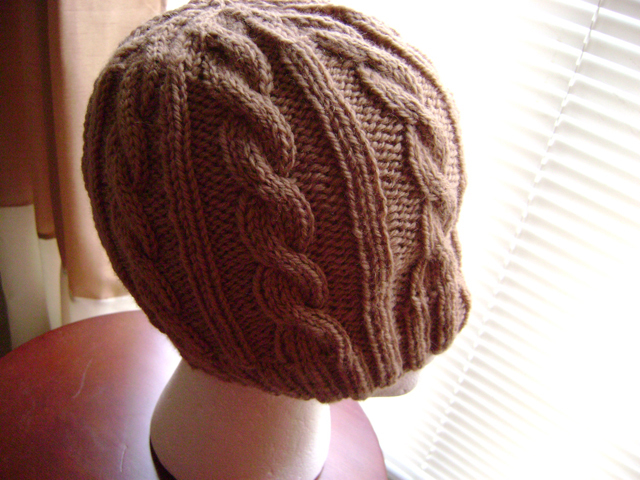 Next up, how about a ribosome hat...bobbles, maybe?